Level transmitter configuration can be very time consuming. Calculations required to determine proper range values for traditional transmitters can become complex due to the physical layout of an application. With maintenance shops getting smaller, finding equipment that allows us to do more with fens becomes a priority. DPharp transmitters with advanced software functionality can eliminate these complex calculations. Depending on the application, the vessel may be open (referencing atmosphere) or closed (under a blanket pressure). Elevation is typically used when the vessel is closed. To reference the blanket pressure, a low side remote seal may be used (or a wet leg). 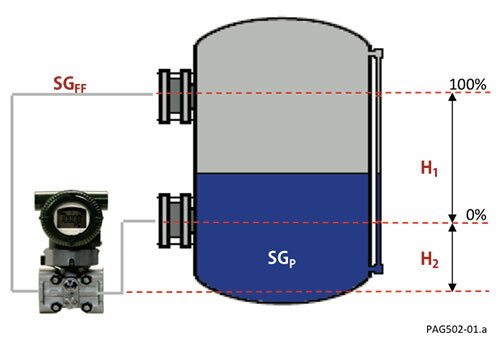 The capillary on remote seal creates a negative force on the transmitter equal to the vertical height times the specific gravity of the fill fluid. Suppression is a positive pressure created on the high-pressure side of the transmitter typically due to the transmitter being positioned below the 0% process connection. Suppression is present in both open arid closed vessels. Suppression is equal to the vertical distance between the 0% process connection and the transmitter times the Specific Gravity of the fill livid. Span is the vertical distance between the process connections times the process medium's Specific Gravity. Now that you have the Elevation, Suppression, and Span, the calibration values can be calculated for the 0% (Empty) arid the 100% (Full). Differential Pressure instruments compare two pressures and transmit the difference to a control unit. These transmitters have a limitless number of industrial applications. Gauge pressure instruments compare a pressure relative to atmospheric measure.